Sauna Classic festival continued the Tampere festival tradition this year, raising the rock scene again from the ashes of the South Park festival, which was held at the same area before. 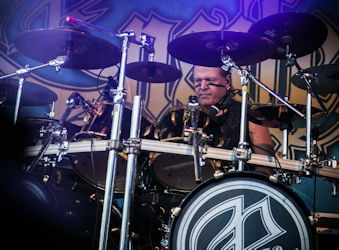 The two day festival was arranged in a smaller scale than its predecessor, the area was half the size from earlier and all the booked bands were Finnish. 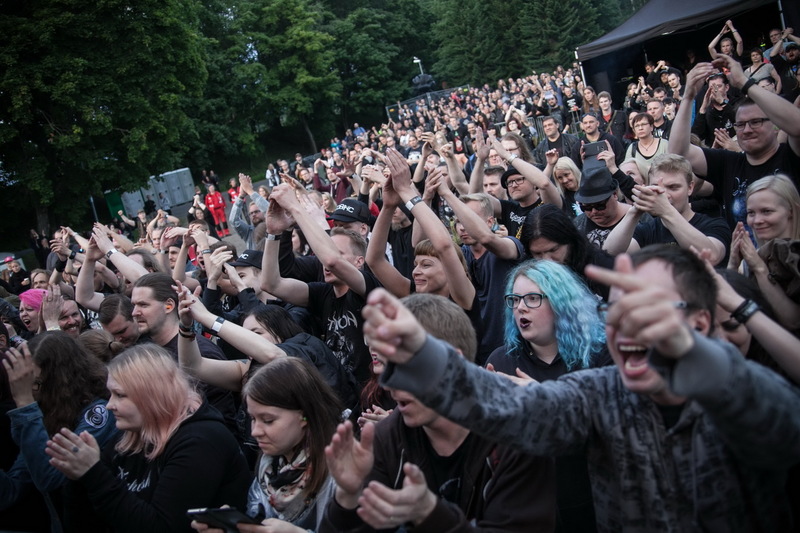 Somehow the festival only managed to draw in a moderate crowd, maybe the weather forecast predicting mostly rain was the reason behind crowd loss, or the fact that there were no foreign bands on the bill. 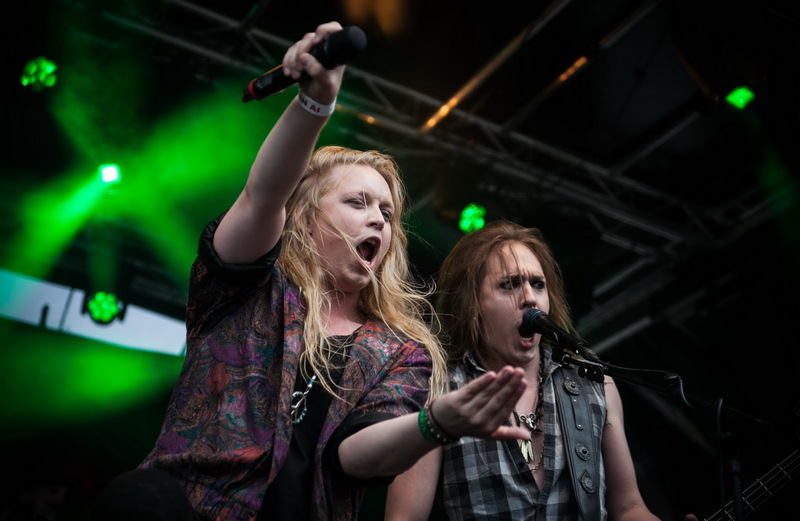 Still, the Finnish bands appearing at the festival belong to the finest group of bands in this metal country and the festival offered more melodic rock bands than Tuska festival. 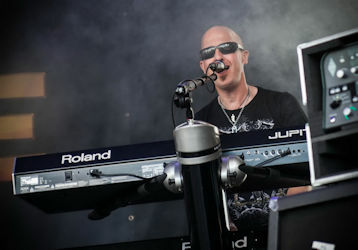 Sauna Classic thus served music closer to the RockUnited readers hearts. We only had a chance to enter the first day of the festival, which started with small rain showers. BLOODY HELL kicked off the festival at four in the afternoon, but we only heard them while waiting for our passes outside. 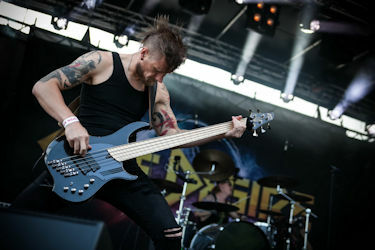 The band plays an interesting cacophony of mixed genres, even involving pieces of vocal theatrics, but mainly being a sturdy heavy metal band with mileage and experience behind them through other bands. Between the main stage gigs the Cover Garden area offered coverbands and eighties karaoke. Bad Apples played Guns N' Roses, Dear Victim played Kiss and New Jersey played Bon Jovi. 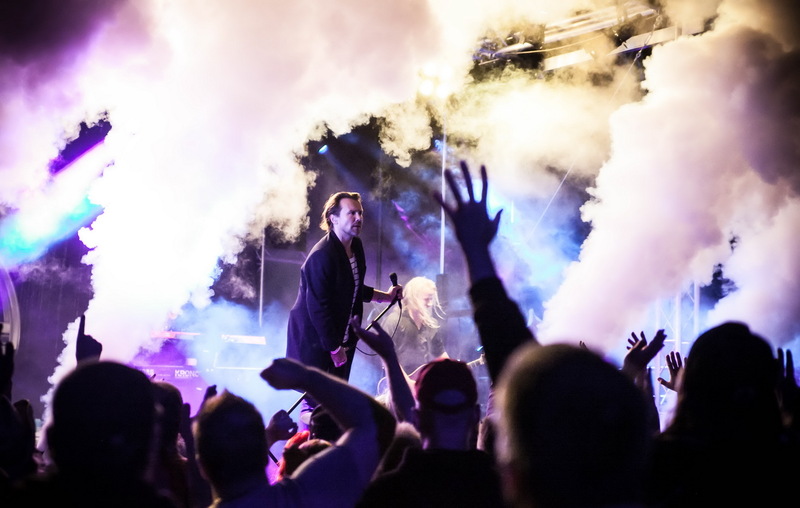 Bad Apples lead vocalist was a lively performer with the attitude to match Guns N' Roses' rebellious music and spirit, and both Dear Victim and New Jersey sounded good to where we were standing at. The melodic newcomers ONE DESIRE started their set at half six o'clock and the area was still quite empty. The band didn't show any disappointment to the crowd though, but entertained their fans as well as they could. Having seen this band live a few times now I can say they have improved through each show. 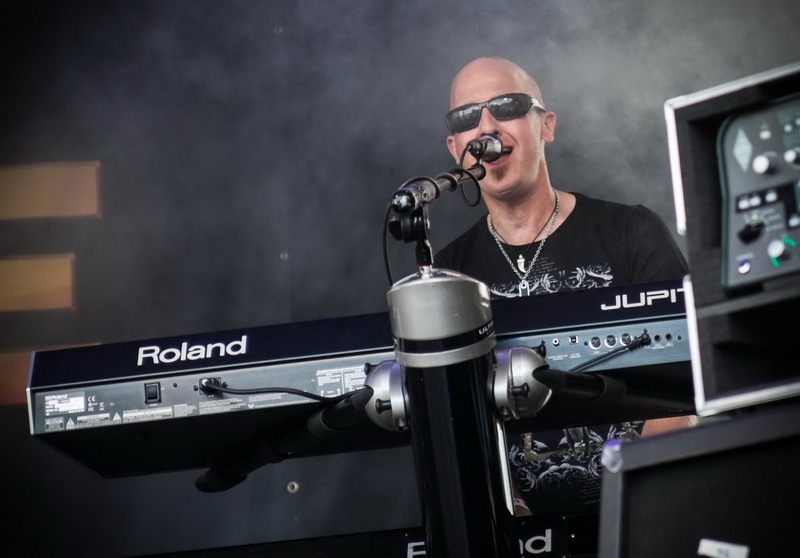 Having the guitar/producer/songwriter wizard Jimmy Westerlund in the band has certainly grown the bands popularity. He's got knack for anything to do with music. 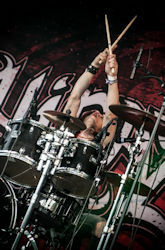 The band started as OD and the only original member left in it is drummer Ossi Sivula, who plays his amazingly small drumkit way out of the spotlight, the drumkit set too low out of sight of the majority of the crowd. 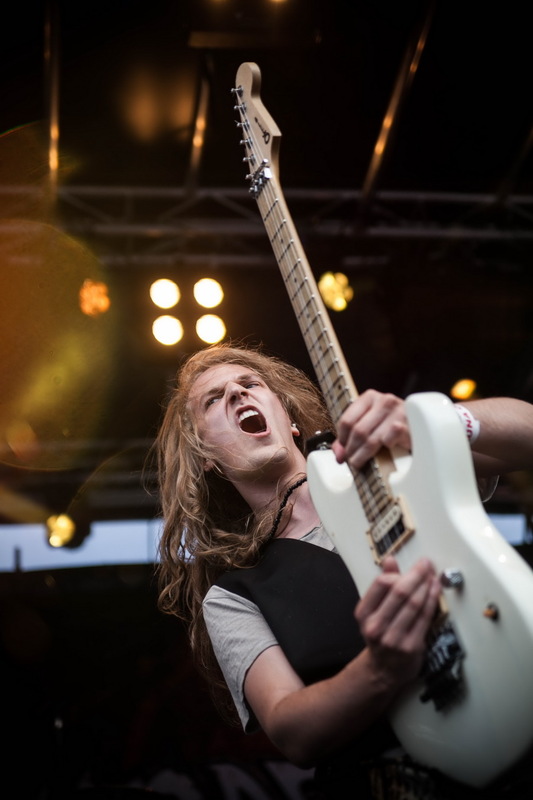 Most of the spotlight goes to the Sturm Und Drang -famed vocalist/guitarist André Linman and Westerlund, Linman being the bands wild youngster, who has improved in his speaches and is a very funny guy. Tampere got some great laughs from the dialogue between the band. 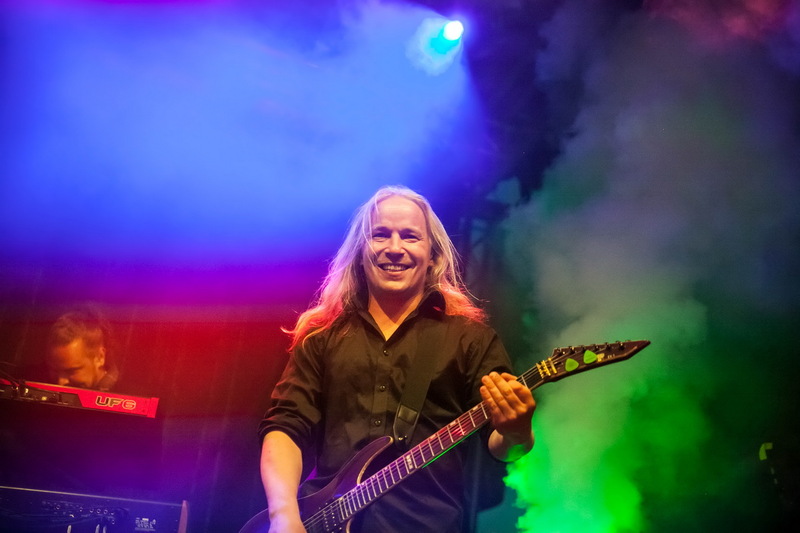 The main joke among the guys is the ev erlasting battle between Finnish-Swedish speaking people, and Sivula gets his share from being the only native Finnish speaking guy in the band. 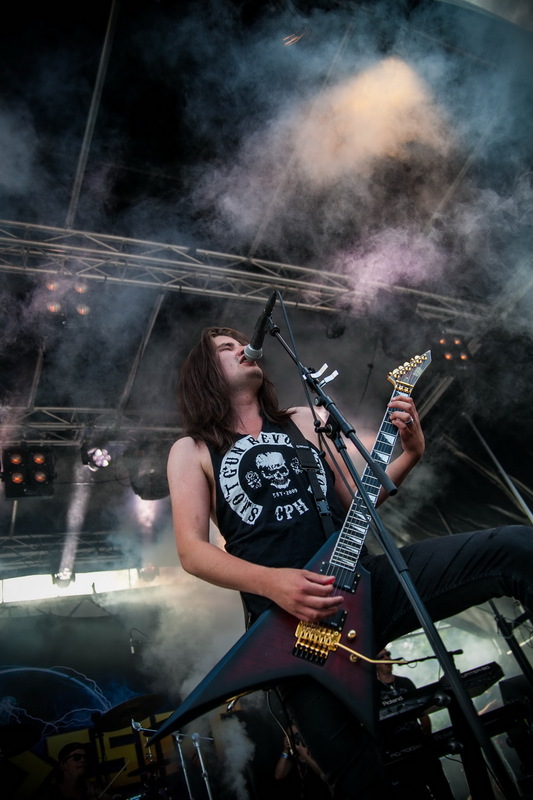 Having released just one self-titled album this year the bands setlist can't yet offer much surprises, and if you catch the band live before the release of the second album you'll have a good chance of hearing everything live from the debut. 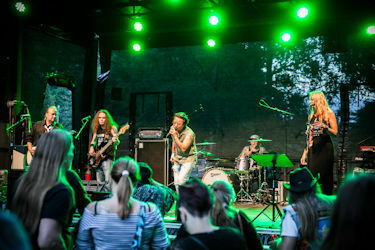 The video and single release song Hurt kicked off the set with a power boost, this is the song most people know, and it lifted the mood well from the cloudy and a bit chilly weather. Although lyrically the song isn't so happy, the rhythm is still uplifiting and the melodies and chorus very catchy. With Finland being the land of dark metal, the cheerful One Desire might be for most metal fans here a bit too light. 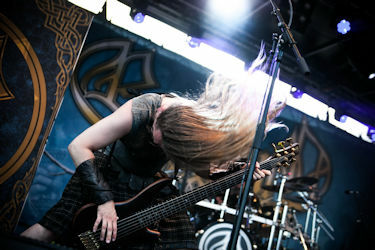 Most of the crowd stayed in the bar area, waiting for their dose of Ensiferum. 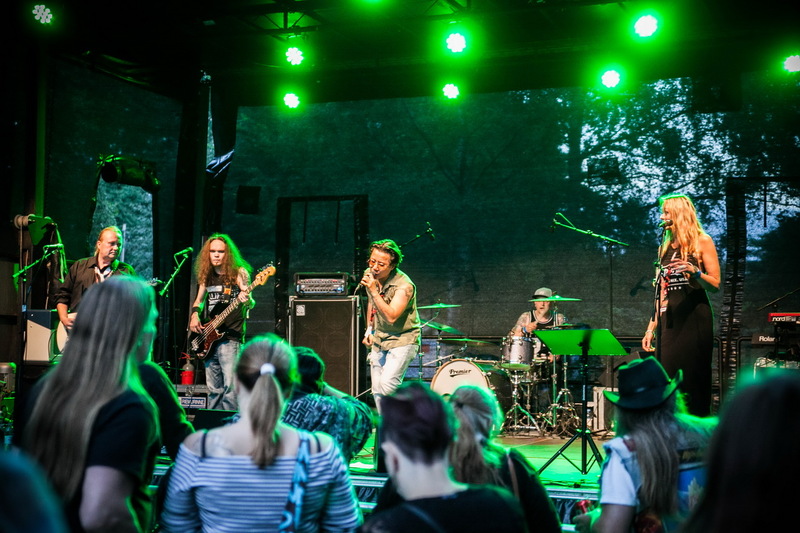 One Desire has been very popular though in Spotify and other apps and charts and probably through those and Linman's old band have managed to gather followers mostly from younger fans. This showed at the festival too, most of the crowd was in their early tw enties. 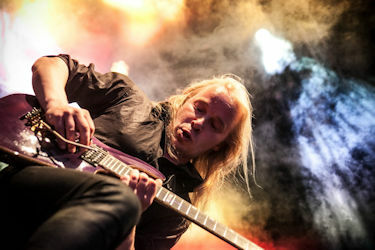 The gig went quite smoothly, both Linman and Westerlund taking turns on guitar solos and jokes, bassist Jonas Kuhlberg joining them on the frontline and keyboardist Antti Roslander and Sivula staying more in the shadows - and in the dreadful pyrotechnic smoke that every now and then engulfed the whole band inside it. The sounds were quite good, but I still wore earplugs to cut off some of the treble that hit to the spot I was standing at. All the single releases were heard live and also Apologize, another video release, but the crowd didn't get to hear the full album. The lively set passed too fast and it was the same case in their earlier gigs, so I was hoping to hear the full album and some surprises. The band has in short period of time improved in many ways and I dare to say this was their best gig so far, although very short, it was less than an hour long. 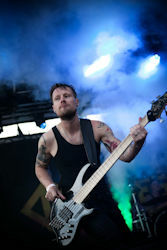 Buried Alive ended the set as usual, giving a good beating to the crowd with its heavy approach. One Desire is not only a melodic rock band, but a band that has influences from various music genres and Buried Alive shows their heavier side. One Desire is young at heart with so much to give and their kind of melodic rock still has demand in this mostly dark and growly land. Finland's rowdy crowd was up next. 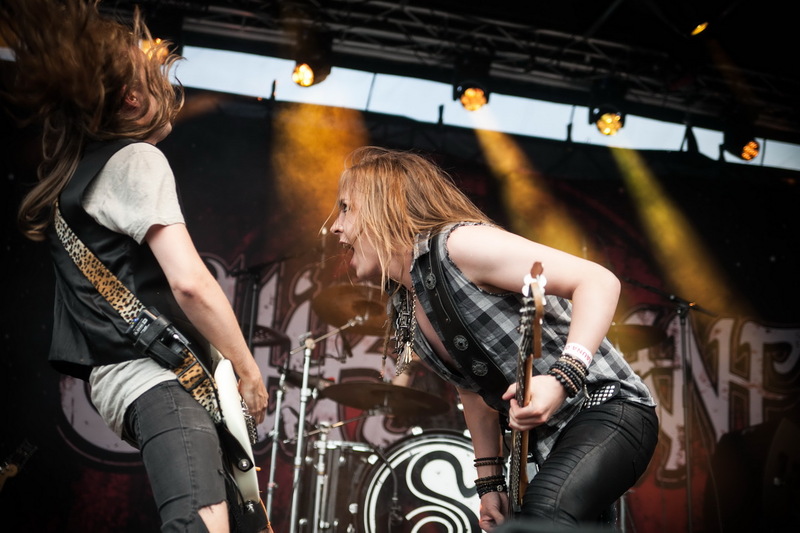 SHIRAZ LANE continued at seven o'clock where One Desire left with, throwing their energetic punches to the crowd. 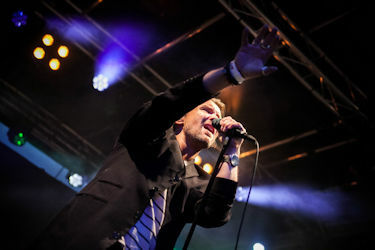 Their set started with the vigorous Wake Up from their debut album For Crying Out Loud (2016). Now more crowd had packed in front of the stage and clearly this band was more familiar for everyone, as people were singing along to the songs more than before. 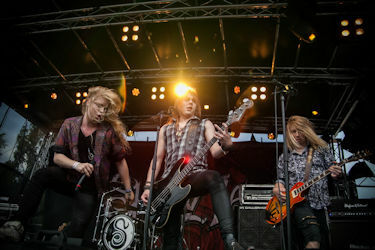 Sadly the rain started again at the beginning of their set, but it didn't seem to bother the band at all, they (Hannes Kett - vocals, Jani Laine - lead guitar, Miki Kalske - rhythm guitar, Joel Alex - bass, Ana Willman - drums) were performing as intensily as before. The crowd soon happily noticed the rain stopping though and the gig could continue in the humid summer weather. Shiraz Lane will release their second album soon and played one new track from it called War of Minds. It sounded true to the Shiraz Lane style and the crowd seemed to like it. There were no theatrics this time which we've seen before, like confetti or straitjackets, probably due to this being a festival show, but the guys keep the show in motion even without all that. 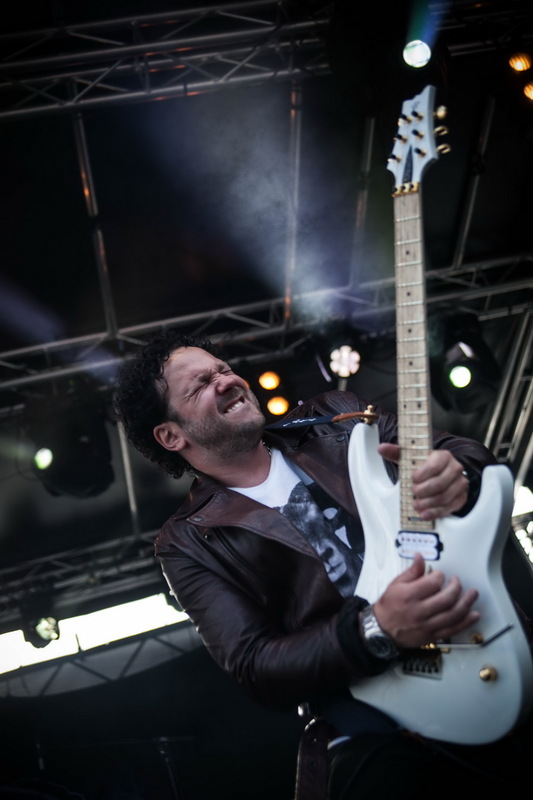 The humour that is part of One Desire gig was also present at Shiraz' gig. It's good that the bands don't take themselves too seriously, it relaxes the crowd and vice versa. The setlist was mainly a high testosterone shot at the crowd with loads of rockers and a medley in the middle, which is part of their routine. The song Same Ol' Blues calmed down the mood a bit, but For Crying Out Loud and the rest of the set raised it again. Joel Alex decided to jump into the crowd near finish line, at Out There Somewhere, and entertained the masses over there through the song. What a cool ending that was for the set. Like One Desire, Shiraz Lane also played the best show I've seen from them and seem to get tighter through each show. ENSIFERUM was, together with Bloody Hell, the two divergents on Friday for melodic rock fans. 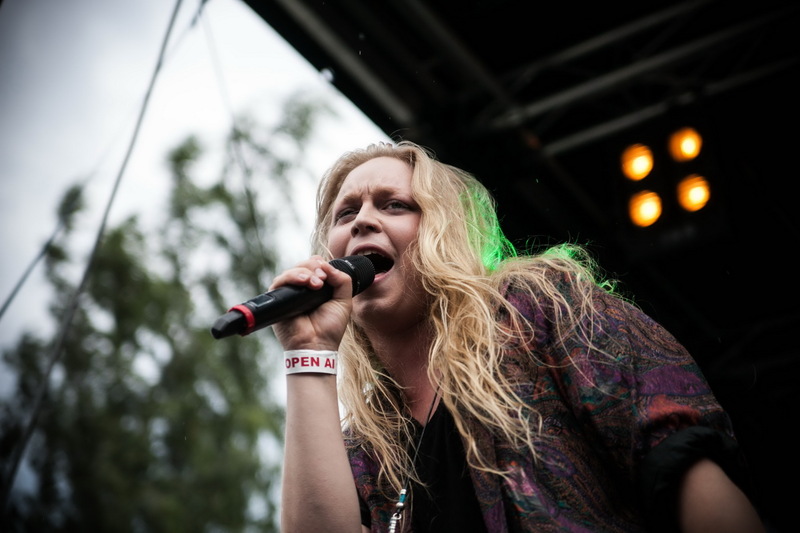 Before nine o'clock the festival filled with their folk death metal with both clean and growling vocals and the digital accordion, played by Netta Skog, as the curiosity. The band is no stranger to using musical instruments outside of metal genre in their music and this makes them interesting, they're not playing by the rules. Or are, but following more of the folk music rules, which the metal crowd is not so familiar with. The festival grounds were now pretty full, Ensiferum clearly drew more crowds in. 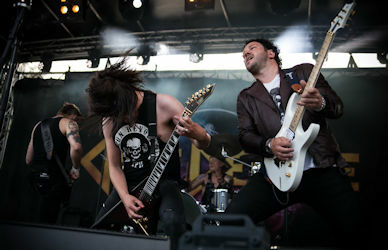 Their fans stuck out from the crowd with their black leather costumes with studs, viking stuff and make-up, with raised fists throughout the show and testosterone-driven roars. Even a small moshpit was created during the show, but I've hardly seen as tough moshpits anymore as I saw in the eighties. This was just cute. 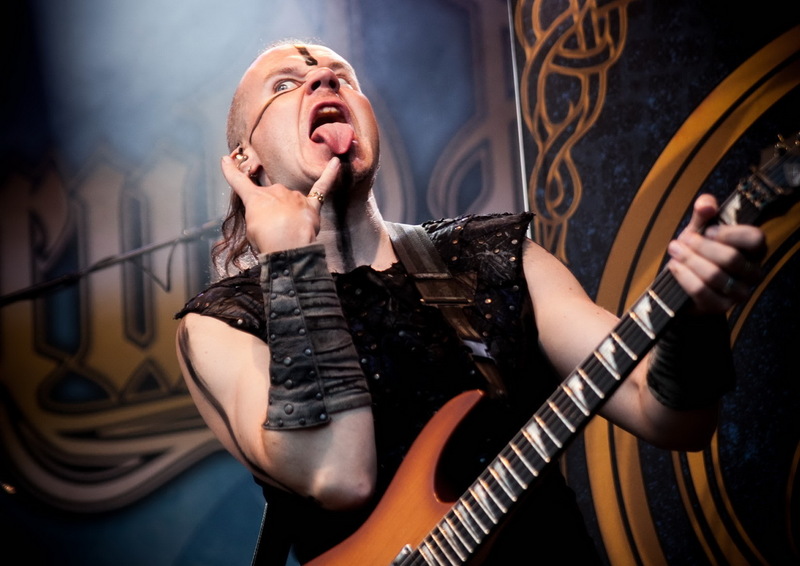 Ensiferum will also be releasing a new album this year, their seventh one called Two Paths. 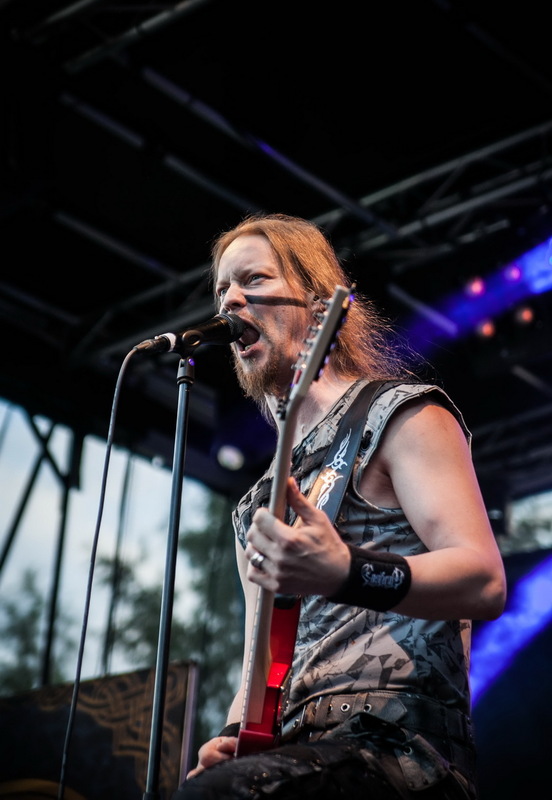 The band has a long history behind, they were formed already in 1995 and today the band consists of Petri Lindroos (vocals/guitar), Markus Toivonen (guitar,/clean vocals), Sami Hinkka (bass/clean vocals), Janne Parviainen (drums) and Skog. Not being too familiar with the bands songs the Shazam song search app was given a try on labeling the songs, but it couldn't recognize them. I was on my own, since the app and neither of my friends around were familiar with the songs. Thankfully the band announced some of the titles. 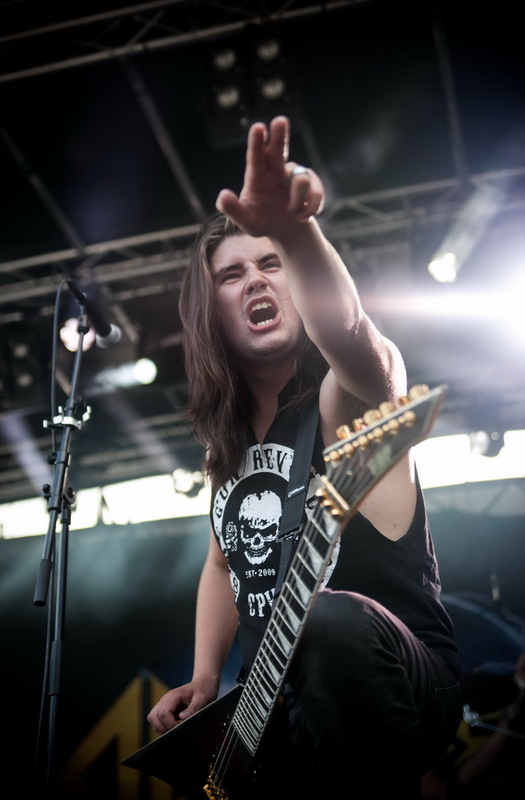 The powerful set worked well and both the growling and clean vocals too. 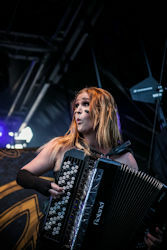 Skog (ex-Turisas) got to show her talents by soloing the Western snippet at Stone Cold Metal with her accordion. 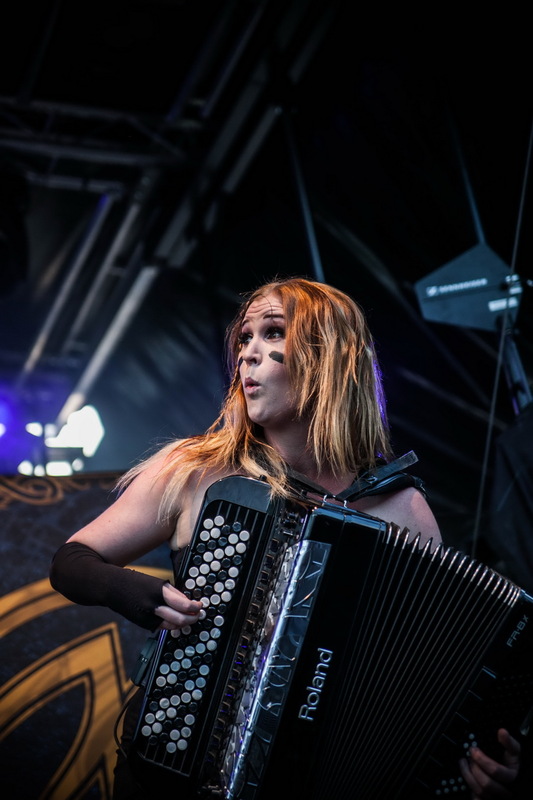 She's played accordion most of her life, even winning the Finnish accordion competition Kultainen Harmonikka in 2006 and the World Championship at the digital accordion competition Coupe Mondiale in 2015. It was sort of a strange moment for the otherwise heavy show, but this didn't surprise the bands fans, just those who aren't familiar with the bands music. Lai Lai Hei closed the set with Finnish lyrics, which for foreign fans might sound weird, but the crowd sang along quite well. 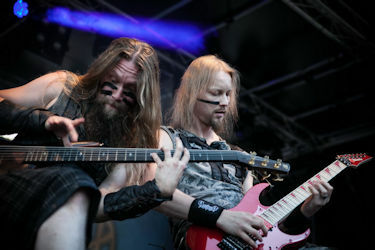 I've seen Ensiferum a few times live and they are always a solid act, which they were also in Tampere. 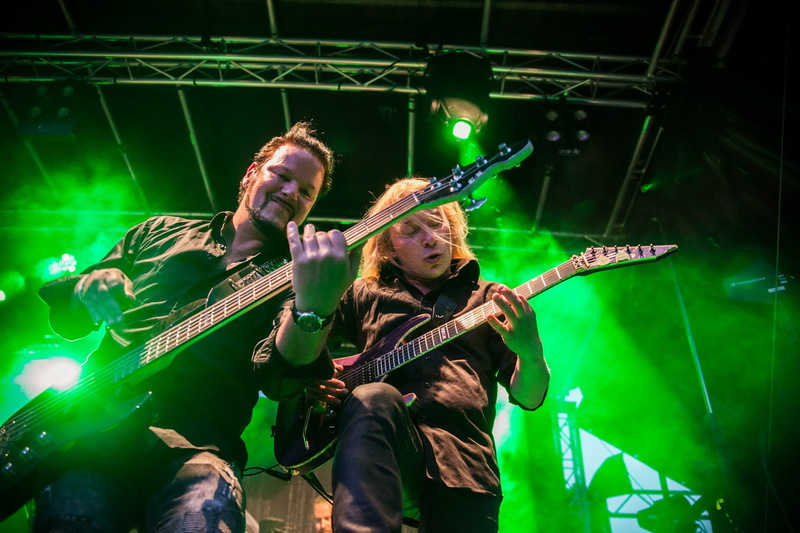 The Finnish melodic rock maestros BROTHER FIRETRIBE headlined Friday, beginning their set at half eleven. By now the crowd that had grown through the day was quite drunk and started packing heavily into the front rows. Firetribe were the only band of the day who were actually mixed so well that you could lose your earplugs, even when you were standing close to the stage. Everything sounded good. 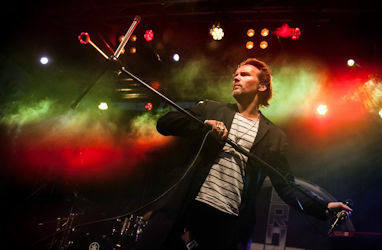 The set began with the upbeat and catchy Help Is On the Way, moving to the video track Indelible Heroes, both tracks appearing in their latest fourth album Sunbound (2017). 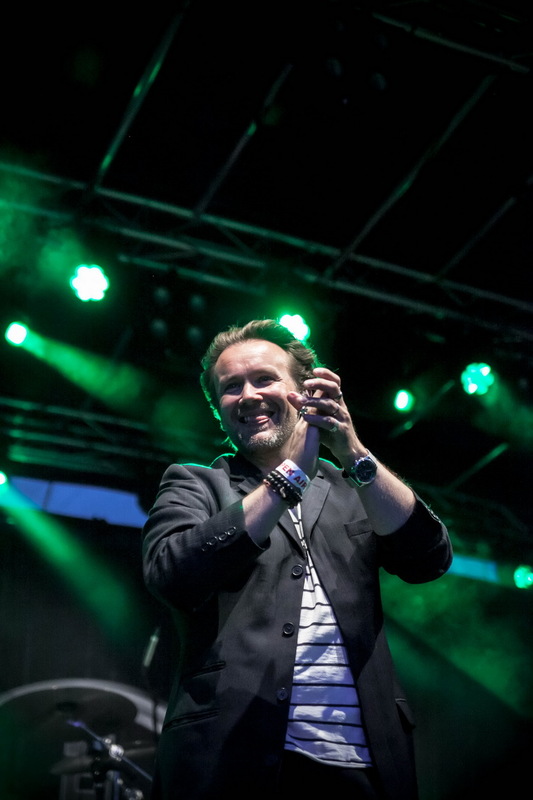 The band performed as cheerfully as ever before, making the drunken crowd sing their lungs off, some offkey, from their hearts. I can't remember seing a show in a while where such a mass of people sang along to most of the songs. 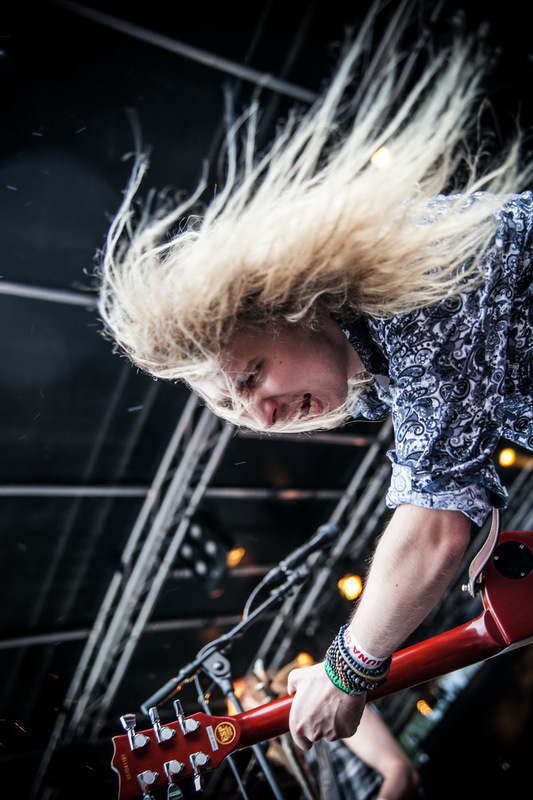 Firetribe's music really gets a hold of those into melodic rock, it was once again proven in Tampere. The bands sweet melodies worked like a snake charmer on a snake, luring the whole crowd int o oblivion, and also into party frenzy. 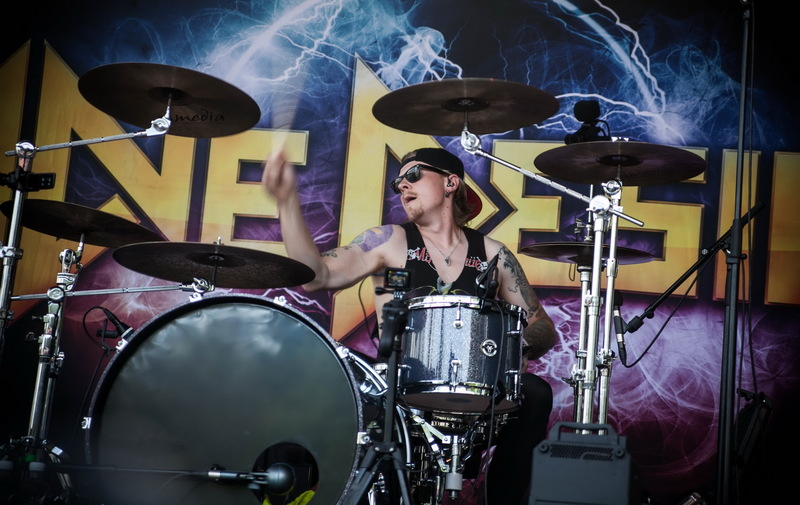 The bands setlist included most of their hits, which have gotten a lot of radio play and hence have gained popularity among bigger crowds. One Single Breath, their first video from the debut, always works for the masses. The setlist still included as much as eight tracks from Sunbound, but the crowd seemed familiar with the album and enjoyed the new songs as well. The amount of pyrotechnic smoke on stage throughout the festival was ridiculous though. 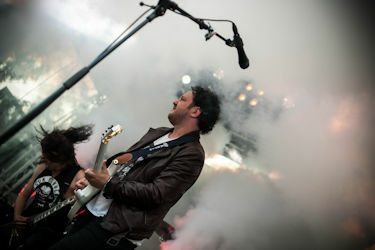 Whenever smoke appeared on stage the whole band disappeared into its clouds. 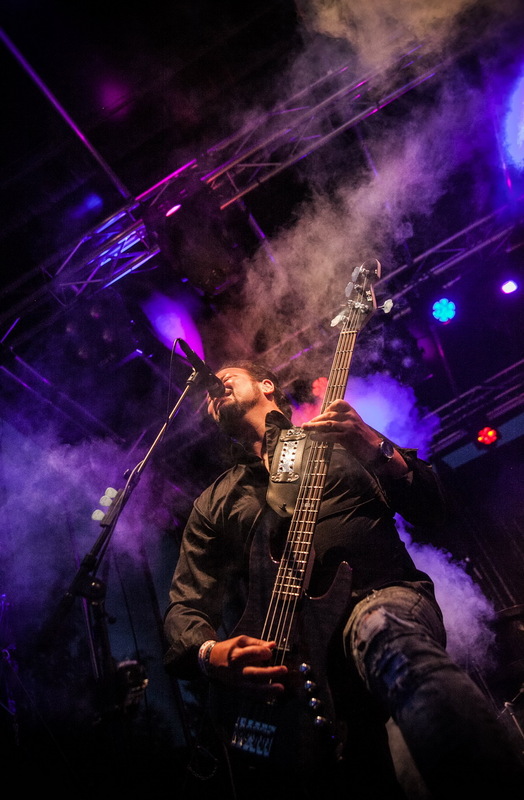 Even Pekka Heino seemed bemused about it and no wonder, the smoke does no good for vocalists pipes. Emppu Vuorinen played his short guitar solos always a smile on his face and greeted fans all over the stage, whereas Jason Flinck played his bass mostly on the left side of the stage, belting his high background vocals tightly. 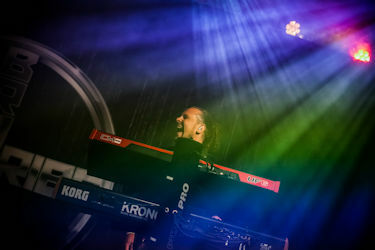 Tomi Nikulainen (keys) and Hannes Pirilä (drums) have their spots in the background, but they don't seem to mind it, they still perform vividly with the rest of the band, with their hearts in the music. 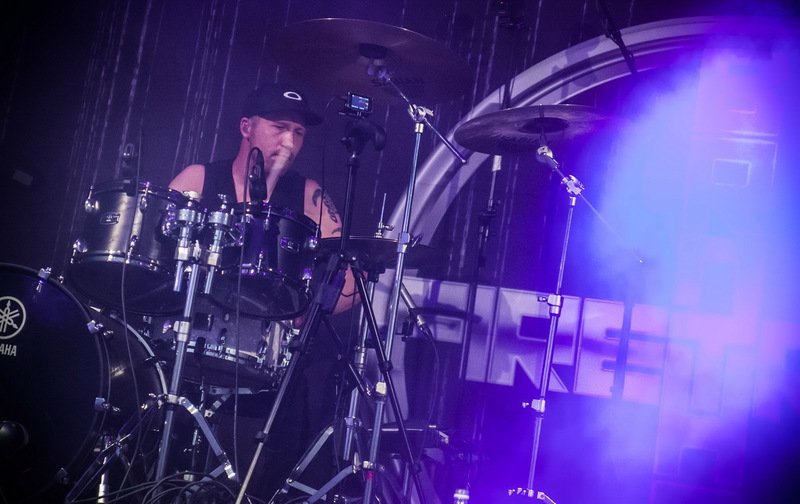 The Firetribe shows are never bland, humour is always present and Heino again delighted the crowd with his identifiable wry jokes. The bubbly show ended with one encore, their heaviest, yet still catchy song I Am Rock and again the show was over way too soon. The festival grounds were emptied really fast afterwards with everyone scattering, so any afterparties were held in the local bars. Saturday's bands were Run For Cover, Free Spirit (replacing Thunderstone), Omnium Gatherum, Turisas and Stratovarius headlining. 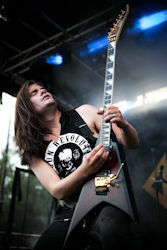 The Cover Garden -area had Kill With Cover playing Manowar, Luca Fly playing AC/DC, Iron Mates featuring Taage Laiho (Kilpi) playing Iron Maiden and Animal House. The Saturday party was probably as good as Fridays. The Cover Garden entertained the crowd well between the roadie breaks, giving anyone a chance to perform or just dance on the fresh grass. The festival goers could also get warmed up at the portable sauna, which was a good idea when the weather wasn't always so warm. The waters of the neighbouring bay weren't accessible though for cooling down after the sauna. 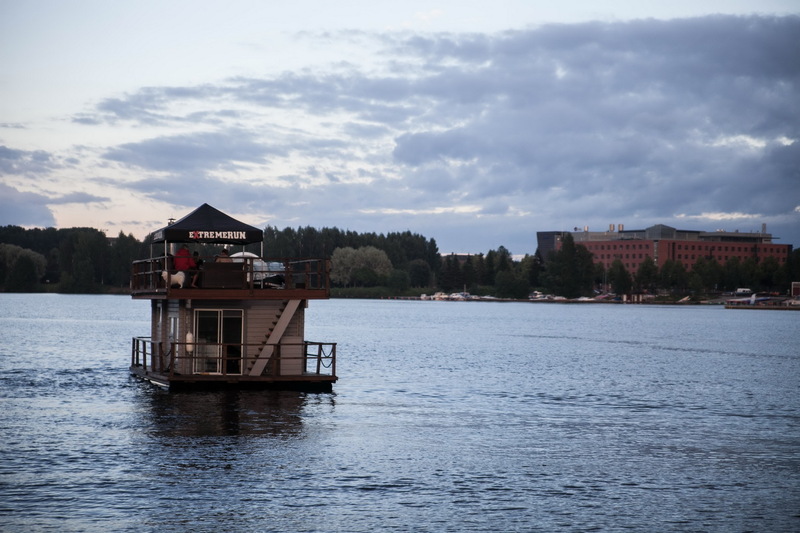 Who could possibly guard the whole drunken crowd from not drowning themselves in the currents that flow to the Tammerkoski white waters, but at least the coastguard was present most of the time. The bay gathered some curious ticketless crowd to witness the festival by boats and jetskis. The small size of the festival might've been a turnoff for some bands, maybe even for some of the crowd, but personally I like smaller festivals. They have more intimacy to them, bringing the crowd and the bands closer to each other, when there aren't tens of thousands of people going crazy around you. The festival was well organized with food and drink stalls at good spots and not much lines (most certainly due to the small crowd) and even serving the vegetarian crowd. The festival was a pleasant experience and the workers friendly too. Next year this area might have something else to offer, but it will most likely continue the heavy metal tradition seen here for years on end.